Enter your name and email address for access to a fully functional demo account. The two main factors that affect a farm’s income, weather and commodity prices, are completely outside of farmers’ control. In many cases a farm is also exposed to input cost volatility that is outside of their control. But there are ways a farm can work to intelligently manage their expenses. This post is going to focus on five ways I’ve seen farms successfully reduce their farm’s cost structure. Unlike other articles that have been published recently that simply tell you that you need to be watching your expenses (obviously! ), the goal of this post is to provide you real-world, actionable ideas. All of them won’t be applicable to your situation and some of them will be common sense. But they are actionable ideas that should at least provide you with valuable “food for thought”. The main theme when looking at cutting your expenses is that it is very harmful to also cut your yields in the process. You need to focus on the ROI of your spending. The main theme when looking at farm expenses: cut the fat, not the muscle! Let’s look at some ideas you can implement heading into the 2017 growing season. I’m going to walk through a situation that presented itself last spring. I was analyzing the financials of a producer and we were trying to identify areas where we could potentially lower his expenses. We decided to focus on his seed purchasing process and expenses. Here are some approximate details of his 2014 corn seed purchases that he gave me permission to share (the same logic can obviously be applied to your 2017 production). His per acre cost for corn seed was $5-10 higher than my average client but it wasn’t too far out of line. What did jump out to us was the fact the he bought relatively small quantities from 8 different suppliers, foregoing discounts in the process. Given the size of his operation, we decided to look into consolidating his seed purchases to the 2-3 highest performing brands for his operation and allocate the final purchases based on who he felt gave his operation the highest ROI. One actionable fact that came out of this analysis was that over the previous three growing seasons his single and double “stacked” corn outperformed his triple stacked. It’s important to note that I’m not an agronomist, I’m a spreadsheet farmer! My opinions are based on numbers. Sometimes I have agronomic opinions but the final agronomic decisions should be left up to those who know more than me. After his in-depth seed performance analysis, he sent an RFQ (Request for Quote, I’ll touch more on this later) to the salesperson from each of the top 3 performing seed companies. He also included field maps and asked each salesperson for their most economical field-by-field seed recommendations and costs if he were to give them all of his business. Two of the companies were willing to negotiate aggressively. After removing the higher-priced, lower-ROI varieties and maximizing discounts, here were his final 2015 corn seed expenses. Even if you are a smaller producer this is a valuable exercise as seed companies are going to be waging a battle for market share in 2017 and beyond. I’ve also heard of a few producers grouping their seed purchases together to maximize their discounts (seed companies tend not to like this but it is done). You don’t have to be a large farmer to receive discounts. 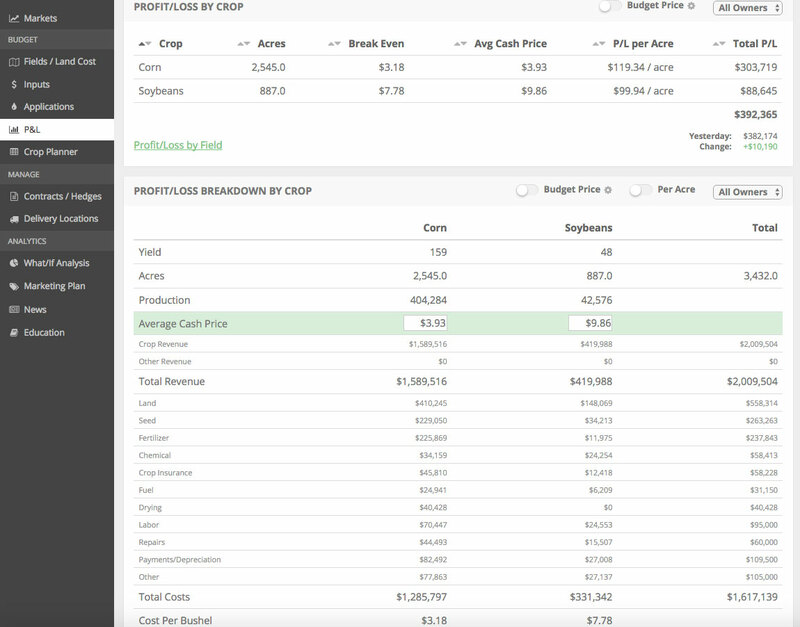 As soon as harvest is over, analyze your seed performance and start talking to your seed dealers about how to maximize the ROI in your seed purchases next year. Given that seed suppliers typically have to chase down their clients to secure orders, you’ll be a “breath of fresh air” to them if you proactively approach them. Consolidating seed purchases can be a sizable cost savings opportunity that is well worth your effort. You need to receive the best value for inputs that you purchase for your farm. Note that I said value, not price. Farming is a unique business where “service” can be quite valuable. Timely delivery and/or application of products can be just as valuable as finding the best price. Formally requesting a quote is a very simple process. All it requires is building a simple form with your required product/products, desired quantity, and any special delivery or financing terms that you’d like. See below for an example. Click the button below to download this RFQ template. I’m not necessarily a fan of putting every purchase out to bids every year but farming is a business. To ensure you’re getting a fair price for your input purchases, I recommend an RFQ process for your purchases each year. You might only send it to one supplier but it gives you transparency and a paper trail to track your purchases. If you distribute RFQ’s to your suppliers in a timely manner they may also be able to take advantage of volume discounts that they can pass on to you. 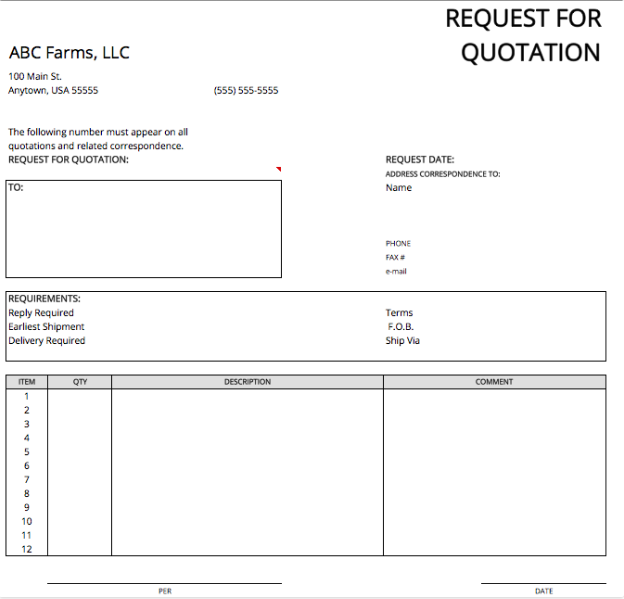 The goals of an RFQ input purchasing program are 1) to ensure you’re receiving a fair price for your purchases, 2) make it easier to track prices and quotes over time, and 3) to give your suppliers the opportunity to find you the best price. A pair of popular farm speakers often talk about trying to focus on finding $100/hour jobs on your farm. I’m confident this is a job that often pays at least $500/hour! Today’s farmer needs to thoroughly evaluate their farm chemical program going forward. Low commodity prices combined with continuing weed resistance issues has led to tough decisions regarding chemical purchases. I’m not an agronomist but a few chemical-related issues have jumped out at me over the last 12-24 months. After a period of flat to decreasing chemical costs, the explosion of resistant weeds has greatly increased chemical expenditure. According to the University of Minnesota’s FINBIN database covering 1,500+ farms in multiple midwestern states, chemical costs remained steady from 2006-2010 but have increased by over 50% since 2010. See the last row in the picture below for the data on corn. Here are a few actionable thoughts/ideas to take into account when reviewing your 2017 chemical program. As always, every farm is different so do what’s best for your operation. Analyze generic alternatives. I’ve seen instances where producers have had great results replacing a $20/acre+ pre-plant herbicide with a sub-$10/acre generic product. Spend some time and research alternatives available on the market today. Do you need a guarantee or warranty? Last growing season many producers were being sold an aphid insecticide that came with a 21-day re-spray guarantee for up to $6/acre when an alternative product was selling for approximately $2.50/acre. Even if you were forced to spray again in the 21-day window you were saving 20% over the product with a guarantee. Be wary of free trips. Everyone loves a free trip (me included)! Spend a few minutes to make sure you’re not spending $20,000 for a $3,000 trip. A simple calculator can be your best asset at times. Be wary of promotions. Recently I’ve heard of promotions where you receive a certain chemical for free if you buy a certain quantity of a different chemical. When analyzing the numbers with a producer, we realized that per acre quantity of the purchased chemical was a lot more than he needed for his operation. Similar to the bullet point above, spend a little time comparing prices from competitors to ensure the promotion is actually a good deal. Resistant weeds are going to be a troublesome issue for the foreseeable future. It’s easy to “throw the boat” at them. But at the end of the day you should be seeking potential alternative products and look to maximize your ROI. The more expensive modes of action aren’t always the best! A flex lease is a great way to lower your farm’s cash outlay in a low commodity price environment. If you’ve been following my writing you know I’m a big fan of flexible farm leases (it’s probably getting a bit old hearing me preach about flex leases but I’m OK with that, its my job!). While cash rents have become the norm, landowners are becoming more open to flex leases as a way to preserve their upside. Here are a couple obvious keys to making a flexible farm lease work for both parties. Given the need for simplicity, I favor fixed bushel leases. Here is an example of a recent lease deal I worked on. A landlord contacted one of my clients with 350 acres of ground for rent next year (APHs of 175 bu corn and 48 bu soybeans). The ground was previously rented to a neighbor for $300 and that neighbor recently ran into financial issues. The deal the producer finalized was a 3-year lease with a base rent of $200/acre and a bonus based on 50 bushels of corn. 50 bushels of corn represents 28.5% of APH. 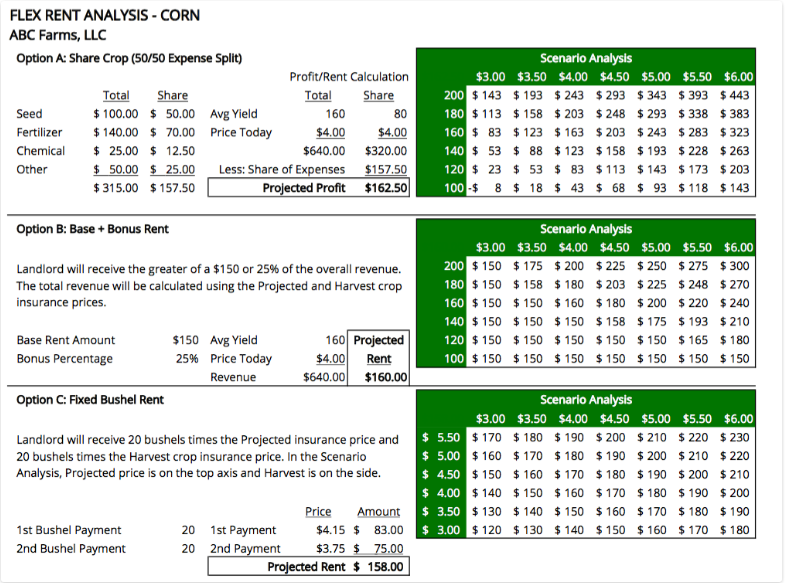 On corn I like to target 25-30% of the gross revenue for total rent and approximately 35% for soybeans. Unfortunately for wheat its hard to come up with an mutually-attractive deal if you’re in a corn-heavy area (that says something about the profitability of wheat!). In this deal, the landlord will receive the base rent of $200/acre in March and a bonus will be calculated using the following formula and payable on November 15th. It should be noted that there is a written clause in the contract where the tenant has to perform thorough drainage improvements. These improvements combined with the bonus structure enabled this producer to pick up an attractive farm at attractive terms (in my opinion). In conjunction with this opportunity, this particular producer let go of 200 acres of less productive farmland that he was renting through a farm manager. He essentially lowered his base rent by over $50/acre while picking up more productive ground. This situation might not be typical but flex leases are definitely becoming more common. You owe it to your operation to at least discuss flex rents with your landlords. Most of you have seen the simple flex rent scenario analysis spreadsheet I’ve built (see below). Click the button below to download this spreadsheet. All-in-all, don’t just assume that rents will never come down. Ask for a concession but offer a bonus (the bonus can be land improvements). I’ve seen it work great. Restructuring your farm’s debt can be a great way to maximize cash flow in today’s uncertain environment. Let’s walk through a scenario that I worked on last year where a producer significantly decreased their annual equipment debt service through a few relatively simple steps. Note that I’ve changed a few of the specific numbers to protect confidentiality but the ratios remain accurate. This producer had a comfortable level of working capital (approximately 50% of revenue) so he decided to pay off two of the highest rate loans totaling approximately $250,000 in advance of the restructuring. The $250,000 in debt payoff left him with a working capital ratio of 42.1%. While he paid off these loans we were still going to offer the bank these two pieces of equipment as security against a new consolidated term loan. Here was our “ask” from the bank. The final negotiated interest rate was 3.9%. Let’s review the new cash flow obligations associated with this loan. Total interest to be paid: $129,334 (an increase of only $3,585) This producer used $250,000 of his equity to reduce his annual cash outlay by nearly $160,000/year. Now its up to the producer to use this savings to continue to build his working capital/equity, not to simply allocate it to pick up uneconomical land for rent. Here are the keys to make this work in your operation. Know your numbers! - You should have your debt payment information easily available to you so you can quickly and easily analyze different scenarios. Have a debt payment calculator handy. Maintain a good relationship with your banker. Obviously. Present your plan to the bank, not the other way around. Debt restructuring doesn’t always have to occur during times of financial trouble. It should constantly be evaluated as a way to maximize your farm’s cash flow. Optimizing your farm’s balance sheet is simply sound farm financial management. If you have any questions on this blog post, feel free to send me an email (nick at harvestprofit.com). If you like content like this subscribe to our email newsletter below. Passionate about farm finances, software, and assets that produce cash flow (oil wells/farmland/rentals). U of MN grad. Copyright © 2014 Harvest Profit - All Rights Reserved. Consulting services offered by Market Wise Ag Services, LLC.